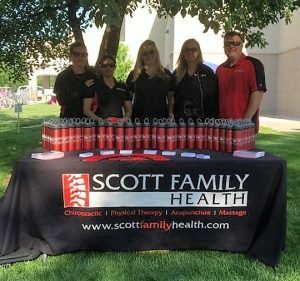 Sierra Krizman worked as the Back Office Assistant for Scott Family Health from 2004-2006. She had the uncanny ability to make everyone feel as if they were her special friend. She always had a smile on her face, a kind word for every patient, and a servant’s heart. She loved to laugh, give hugs, and offered help to anyone whether they needed it or not. She went above and beyond for her friends, family, and our patients. When we had a deaf patient come into our clinic, Sierra bought a sign language book that she excitedly studied so that she could communicate with her. Even though she didn’t learn every single sign, the effort still made the patient feel special. Sierra was a child at heart and she loved to play practical jokes on her co-workers. She once took an old mannequin from our former Neck Back and More Store, named her Ruby, made her a MySpace page, and would leave her on co-workers doorsteps or peering through their windows as a joke. Her love for children inspired her to become a teacher. And even though she was busy studying at UNC, she always made sure that she was focused on her job while she was here. We could not have asked for a better employee. 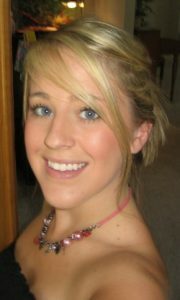 Sadly, Sierra contracted bacterial meningitis and passed away on April 10, 2007, just weeks shy of her 21st birthday. More than 500 people attended her funeral, for many people it was standing room only. One girl got up to speak and said that she was very unpopular in high school, but that every single day Sierra came by and said hello to her. She didn’t know if Sierra even knew her name, but she said that Sierra had made her feel special every day. While we are still reeling from her loss, we have found comfort in making sure that her memory lives on. We participate in the annual Sierra’s Race Against Meningitis, help raise money for her foundation, and volunteer our services on race day. But the greatest way that we can honor Sierra’s memory is to “Be Like Sierra.” Treat everyone around you with love, make everyone feel special, and go the extra mile even though you might be tired.